The Jonestown tapes have been a prime ingredient in Daniel Buckley’s musical experimentations since the early 1980s. Musical examples are found at the bottom of this post. Beginning in the early 1980s with tape loops and progressing through 8, 14, 16 and 24-bit sampling technologies in the mid 1980s and beyond, Buckley manipulated the recorded sounds of Jim Jones and his followers into musical and rhythmic elements. 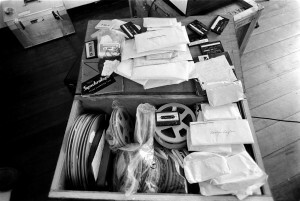 Along the way Buckley added vocoders, DJ technology and a variety of real-time filters and sound alteration software to change the sonic character of these recordings. With that, the tapes could become pure sound elements for further experimentation and discovery. In early 2009 The Jonestown Institute gave Buckley full access to all of the recordings recovered from Jonestown, as well as others later donated by family members, etc. Buckley has since been studying these tapes and breaking them down into sonic chunks to be used in future compositions, and ultimately in the Jonestown opera. The collection is so vast that it may take several more years to fully ingest the recordings and map them into usable keyboards. The bulk of that key step of editing, formatting and restoration work remains to be done. So what is sample mapping? We all know the piano keyboard. Basically you can think of that keyboard as a map of the strings within the piano case, progressing from low notes to high notes in the equal temperament tuning system of western civilization. A digital sampler can be thought of as turning that keyboard map into a series of sound element triggers. One might take a single sound, for example, and center it on middle C. By default this would map that sound over the entire keyboard, compressing and rarifying the sound in accordance with the mathematics of the equal temperament scale. In other words, since an octave is a doubling of frequency of the fundamental sound, a key struck an octave above middle C would sound an octave higher and would play in half the time. Similarly a key stuck an octave lower would sound an octave deeper and would take twice as long to play as the fundamental sound. This has all sorts of implications when looping sounds in terms of creating complex canons (rounds) of sound. 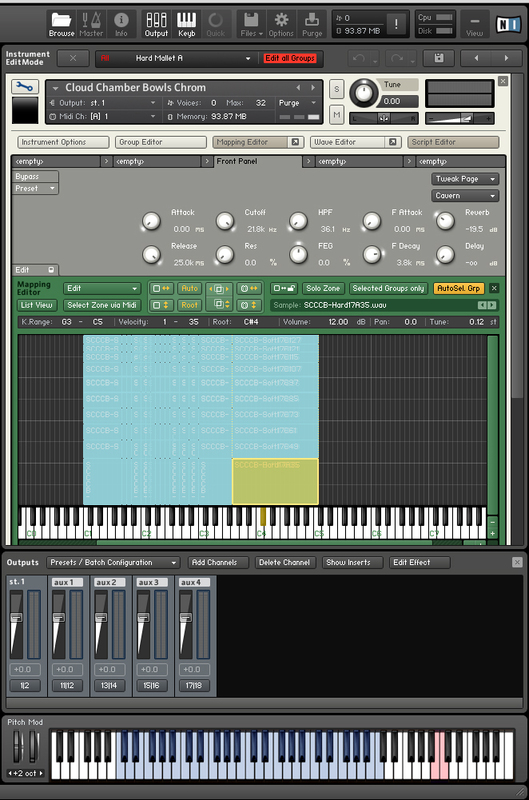 Using Native Instruments’ Kontakt sampling software to map prepared piano samples. That’s the way samplers treated a single sound in the very beginning. But as technology progressed, it became possible for a single sound to be mathematically mapped in such a way that only the pitch would be altered by changing key and the length the triggered sound would take to play out remains the same. This gives a whole new range of possibilities when working with sound. But what happens when we use more than one sound? There are several ways that can be accomplished. One involves mapping a few sounds over the range of the keyboard. For example, you might want to map an individual sound to each octave, giving you a range of timbres and pitch ranges. This is especially helpful with percussion instruments, for example. But you can go much further than that. One can set up the mapping such that each key triggers an individual sound. 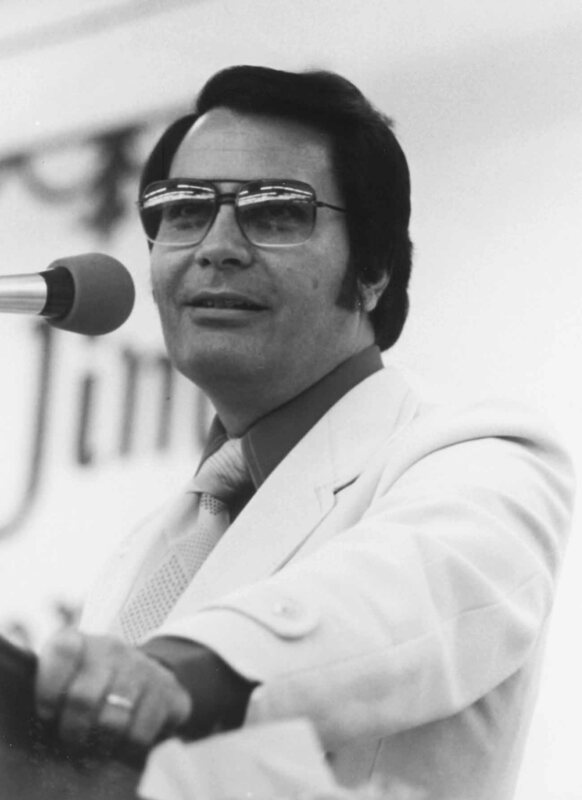 In the case of the Jonestown materials, one might map a spoken phrase such as the lowest key has the first word, the next key the second, etc., so that one might play out the entire phrase just by progressing up the keys. In such a mapping situation, one might also play new phrases by randomly, or non-randomly, playing out different words in series. Beyond assigning each key an individual sound, one can also map key velocity or pressure. In other words, one can assign the mapping in such a way that a soft strike of the key triggers one sound, a little harder triggers a second sound, a bit harder still makes a third sound and very hard triggers a fourth completely separate sound. This “velocity mapping” is how the best sampled piano sounds are constructed, where each key might trigger 30 or more variants of that individual note, depending on how hard the key is struck. There are a lot of possibilities inherent in sampling technology alone, just from the standpoint of key mapping. Within most modern samplers there is also the possibility of adding effect from within – digital delay, filters, etc. I prefer to use “dry” (unaltered) sounds and add effects later in the signal chain, but it’s a matter of choice. The latest generation of samplers can trigger what are called “round-robin” sources. In other words playing a single key at the same key velocity (key pressure) can trigger various versions of the same sound. For example, a sampled guitar sounds infinitely more real if each time one hits that note it triggers a slightly different articulation of the sound. For a composer such as myself, round-robin technology means that I could trigger multiple words with from a single key, or the same word or phrase treated with a range of filters or effects. It’s purely random, but great fun! Because samplers are really synthesizers that use sampled sounds at their core, one can also take advantage of such things as pitch bend and modulation wheels to alter the keyboard sound on the fly. And for that matter, it doesn’t even have to be a keyboard triggering the sound. A wind controller, MIDI guitar, drum machine or even an iPad might be used to trigger and alter sounds. Each year new technology comes out that significantly enhances the ways in which a composer is able to trigger, treat and vary sound. What that means in terms of my Jonestown project is that I will have new ways of exploring these materials for many years to come. 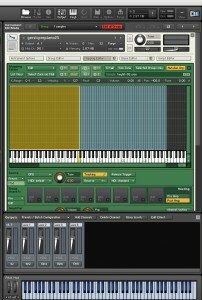 My current go-to software sampler is Native Instruments’ KONTAKT. I also use MOTU’s Mark V, SoundLi’s G-player, UVI’s Ultimate Soundbank, EastWest’s Play, Vienna Instruments Pro, Garritan Aria and other sample playback engines. Here are a few fairly straight treatments of materials from the Jonestown tapes, from various decades. During the early 1990s Buckley started working with his first “professional” sampler – the Ensoniq EPS. Heavily hampered by its lack of memory, one had to learn to work around its limitations by creating short samples and transposing the pitch downward to achieve a sense of elongation and duration. “Jonestown Swings,” an instrumental work, here excerpted, strives to create the eerie sound of abandoned playground equipment blowing in the wind in the wake of the Jonestown tragedy. In the late 1980s and early 1990s, Buckley was using Casio SK-5 8-bit sampling technology as cheesy instruments in conjunction with phrases from the Jonestown tapes. As the 1990s started, his concept of how to musically approach the Jonestown materials was also in transition. Jones was, after all, a man who appeared to be one thing but actually was something far darker. Using traditional Hungarian modes a la Bartok, Buckley was trying to project this underlying sense of menace behind Jones’ comforting words. “Think Back” for Casio piano and the voice of Jim Jones is an example of this phase of work. In the mid-1990s, Buckley was approached by Kronos Quartet first violinist David Harrington to write a string quartet for the group using elements from the Jonestown tapes. Harrington was compiling music for a CD of music that used spoken word and string quartet. In late 1996, Buckley delivered the four-movement “Soul Seduction: A Jonestown Scrapbook.” Unfortunately a series of personal tragedies within the group that coincided with the delivery of the piece, and it has remained unperformed. The realization heard here is from a mid-1990s sampling keyboard mockup. Like “Think Back,” Soul Seduction” uses Hungarian modes to generate the desired air of creepiness. But unlike the elastic-metered “Think Back,” “Soul Seduction” is scored in the form of three funk movements and an opening African-inspired movement. The “story telling” in each section is linear – in other words, it follows the progression of the original tapes to a large degree. Movement Two draws its material from a night when Jones was browbeating an elderly African American follower for wanting to go back to visit his family. Movement Four pulls material from a “white night” – basically a dress rehearsal for the inevitable mass suicide – during which Jones whips his followers into a frenzy, convincing them that they are about to be attacked by armed forces from the U.S. Like many classical works before it, the movement quotes the “Dies Irae” (Day of Wrath) Gregorian plainchant from the mass of the dead. “Totentanz 1,” presented in excerpt, is a piece from 2008 written as a sketch toward what will become an early piece in the Jonestown Opera. Dramatically the opera unfolds as a flashback on Reverend Jim Jones’ life that begins after he is shot to death, at the start of the opera. At that point, a Day of the Dead flamenco dance takes place around Jones’ body. Scored for orchestral percussion, Jonestown voices and solo violin. A “totentanz” is a dance of death, frequently using the Gregorian “Dies Irae” (Day of Wrath) chant from the mass of the dead. The most famous totentanz is Franz Liszt’s remarkable variations on Dies Irae for piano and orchestra. “Dark Sparkly” is another of the Totentanzes, composed in 2008. The piece uses much of the same story line material as the fourth movement of the “Soul Seduction” string quartet. Musically it’s a dark disco piece with power-chord rock guitars, synthesizers and orchestral winds and brass. What is termed for now the “Choral Montage” is a sketch toward what will eventual become the overture to the Jonestown opera. Scored for massed voices and orchestral percussion, the sketch is from 2008. “Danza 1,” here excerpted, is an instrumental sketch for another of the Jonestown Totentanzes. What it is! “Twilight,” from late 2010, combines sampling with formant analysis to create a mix of “real” and synthesized sounds. Originally scored for clarinet, harp and tympani, the tympani track was later process using formant shaping technology to produce a sound somewhere between synthesizers and strings. The instrumental piece is intended as a dramatic interlude to be played as dawn breaks on the morning of the final day at Jonestown. Followers of Jones have been passing messages to Congressman Leo Ryan’s staff all night, saying that they want to leave with him in the morning. When they attempt to do so, they are murdered along with the congressman, and Jones convinces those who stayed that their only course is suicide. The music for the dawn of the final morning is beautiful at first, then foreboding. All rights reserved, Saguaro Furnace music publishing. ~ by Daniel Buckley on August 27, 2011.